Like anyone who has seen the Louis Vuitton Cup races, I stand in awe of the technology of the AC72 yachts, and admire the skill of the sailors and designers who have learned to sail these phenomenal vessels to such high performance. I would praise the crew's courage as well, but most of them have proved that many times over in the Southern Ocean in other boats in even more dangerous conditions. But these are still sailboats and this is still supposed to be yacht racing, which has stood for the highest standards in sailing and seamanship for more than 100 years. As such they set precedents for the whole sport of sailing that reflect on the concept of seamanship for all mariners. A hallmark of good seamanship is getting safely where you want to go, and to show up with everyone on board who departed onboard. In fact, the International Sailing Federation (ISF) Racing Rules require that you cannot finish a race if you do not have onboard everyone who was onboard when you started. It is stated in Rule 47.2. However in Race 1 of the LV Cup, ETNZ was allowed to win a race after losing two crew members overboard. They were safely rescued by a chase boat, but that is not the issue at hand. The question raised is the change of Racing Rules that allows this to happen without even a penalty charged. In my opinion this sets a very poor precedent, not to mention that it is not a sustainable rule in the first place. Suppose the two sailors did not survive? Or look at the ISF Rule 41 clause on outside help. Would you consider the outside help of the chase boat in saving the lives of two of your crew members as a "significant advantage"? But the AC Rules committee got around that by just removing that clause from the Rules as well. Or what if all the crew were washed overboard on a round up at the finish line and the boat went on to cross the line on its own. Would they still get to count that as a win? I would propose that the pundits of the race (who by the way are doing a good job of the reporting) devote some air time to this issue and that the Race Committee at least consider some form of penalty to cover cases of crew lost overboard. If there are no consequences for losing crew, the safety factor and image of good seamanship is bound to suffer. Here are the related Rules, with italics added to the subjects at hand. 47.1 A boat shall use only the equipment on board at her preparatory signal. 47.2 No person on board shall intentionally leave, except when ill or injured, or to help a person or vessel in danger, or to swim. A person leaving the boat by accident or to swim shall be back on board before the boat continues in the race. 47.1 A yacht shall use only the equipment on board at her preparatory signal. 47.2 A yacht shall not permit any person on board to intentionally leave unless ill or injured. Except as a result of a capsize, a person leaving shall not be accepted back on board nor replaced during the race. (e) after a capsize, help to recover the yacht. where dH is the change of the draft relative to your standard waterline, which does not change much in small boats but can in larger vessels. 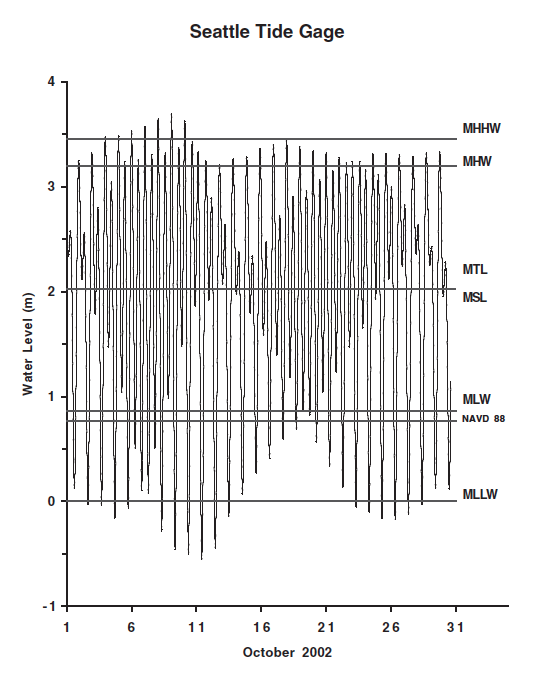 In large vessels the reference is usually the Summer Load Line (SLL). dH can be 15 feet or more in tankers and routinely 5 ft in cargo vessels. 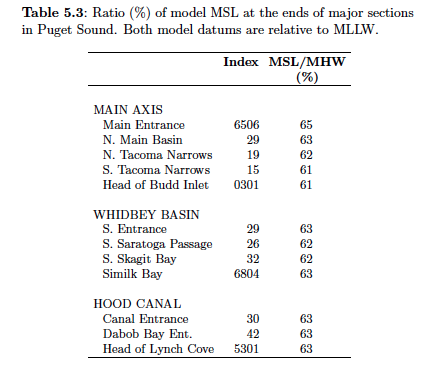 This correction is based on the approximation that MSL is very nearly equal to the Mean Tide Level (MTL, halfway between MLW and MHW). This approximation varies within Puget Sound from 0 to 4.5 cm, but it is plenty close enough for considerations at hand. The task at hand now is to look at actual tide ranges in Puget Sound to show the relative significance of this barometer correction, and in doing so we learn some about how the tides vary along the length of what is often called Puget Sound, namely Port Townsend (PT) to Olympia (Oly), though this is not a strictly valid name, in that the upper portion of this water way where PT is located is called Admiralty Inlet and Puget Sound starts at the base of Whidby Island––another detail that does not matter for now. For those less familiar with the region, here is a bathy map of the area. We have two highs and two lows and they are typically not equal, giving rise to a higher high water (HHW) and a lower low water (LLW) each day. A sample day's tide in Oly at the time of this writing is given below, which are typical values. These are numerical computations (real data below) which I show because they are already plotted! This and other pictures presented here are from a tidal research paper called: Tidal Datum Distributions in Puget Sound, Washington, Based on a Tidal Model, NOAA Technical Memorandum OAR PMEL-122, Nov. 2002, by H.O. Mofjeld, A.J. Venturato, V.V. Titov, F.I. Gonzalez, J.C. Newman. 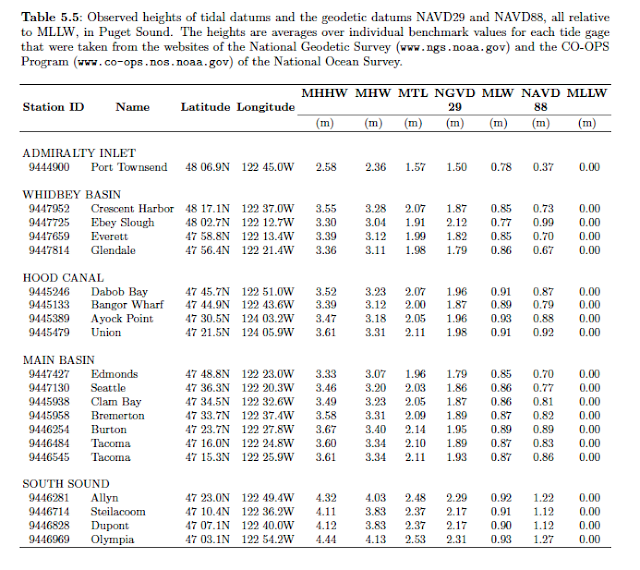 Their goal was to compute all of these values and compare with the tide gauge data, and they did a good job of it. I will show the actual numerical data at the end, but this nice plot shows what is going on. The left is PT; the right is Oly. Again, the fact that these two places are actually only 166 km apart is not important now! One could extract the MSL correction from a drawing like this, but the actual computation using real values is not hard, so we do not need that. But we do see that the deeper you go into a tidal estuary, the higher the tides and the larger the correction. 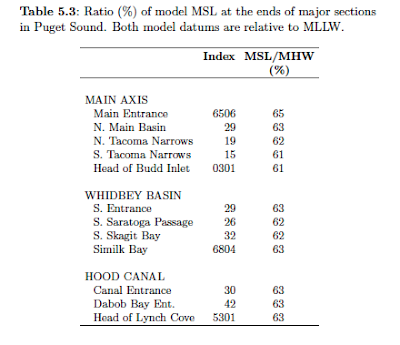 This example is for Puget Sound, but you would get the same type of data going into San Francisco Bay, or Chesapeake Bay, or New York Harbor. 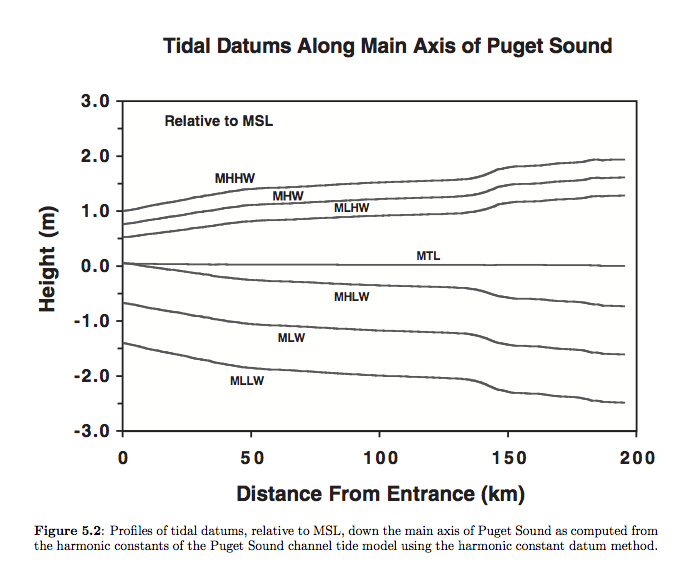 This plot shows that if you were doing the correction at MHH tide in Oly, you would have a MSL correction of about 2m (6.6 ft, which is 0.2 mb). At LLW it is about 2.5m (8.2 ft = 0.3 mb). Throughout the Sound, the MSL is about 60% of the MWH, and that offers a quick way to make the correction. For example, if MHW were 10 ft and the tide is now 13 ft, then the correction is about 13 - 6 = 7 ft. In other words, if your barometer is 5 ft above the water line and the tide is 13 ft in a region where the MHW is 10 ft, the the height you use to correct to sea level pressure is not 5 ft, it is 12 ft. The mean sea level is 7 ft under water. And now at this point I can imagine what might be going through the minds of the reader: Wow! Why bother with this at all? That is fair enough. In Puget Sound this is a small effect in all but rare cases, but we would not know that without some analysis... and we can be happy we are in Puget Sound and not near Anchorage, where the tide range can be more like 30 ft, or the Bay of Fundy at 50+ ft.
Each little bit matters if you want to do your best. That is, if you have a good barometer that can give a dependable pressure to within a couple tenths of a mb, then we do not want to lose accuracy we do not need to––or we do not want to question our good barometer that seems off 0.3 mb at a very low tide when it had been so good in the past. Likewise we want to know accurately the barometer height above the water line, and not just guess it. It is analogous to the Height of Eye needed in celestial navigation sights. Rather than guess it, take the time to measure it once then that uncertainty goes away. 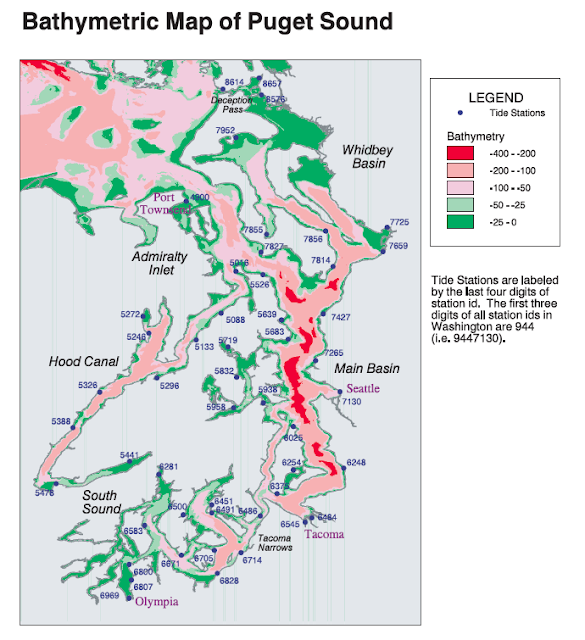 For completeness, below are the actual tide data from Puget Sound and adjacent waterways. 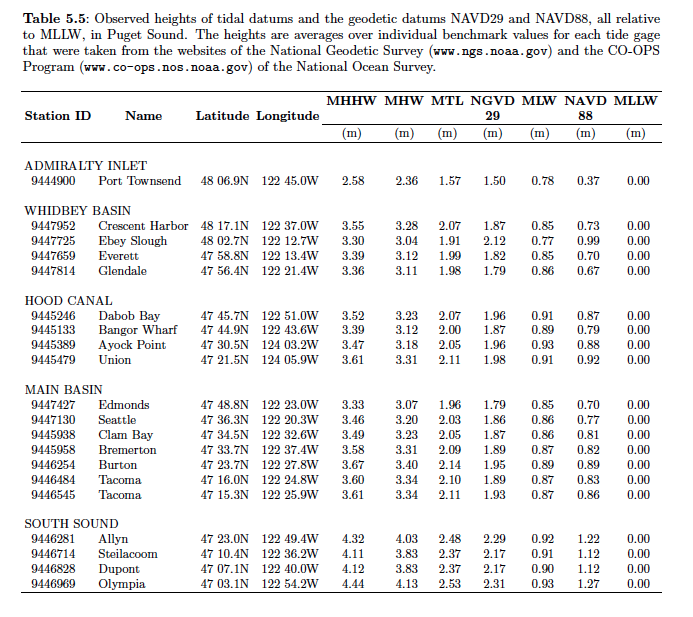 You could piece this together from NOAA data online for any other large tidal estuary. This compilation is from the same paper quoted above. You can disregard the two geodetic datums listed, which are not related to our discussion. MHW and MLW are listed on most charts. There is typically a table showing multiple values for a small scale chart. Several years ago we developed a jingle for making elevation corrections to barometer readings for quick conversions from station pressure measured at some elevation to sea level pressure needed for weather work. It goes "Point four four per floor," which is intended to remind us the that pressure drops 0.44 mb for every 12 ft we rise above sea level––we are calling 12 ft a floor, which is more or less right for buildings with multiple floors. Needless to say, we chose the word because it rhymes, not because it matches some architectural standard. If your barometer was 120 ft above sea level and it read 1012.5, then you would increase that by 4.4 mb to read 1016.9 to get the equivalent sea level pressure. More generally, the correction is just (H/12) x 0.44 mb. This jingle will serve many needs we have in this department. The barometer on my boat is, mounted 6 ft above the water. It reads 1015.1 mb. The tide is 13 ft, MHW = 8 ft, MLW = 2 ft, so mean sea level is (13-8) + (8-2)/2 ft, which equals 8 ft below the surface of the water. So this barometer at this moment is 14 ft above sea level, and thus I need to correct it by: (14/12) x 0.44 = 0.5 mb. The correct SLP at this moment is 1015.6 mb. If this moment happened to be a synoptic time (i.e. 00, 06, 12, 18z) then I could wait a couple hours for the next weather map that covers this time, and I should see that pressure on the map at my location. Or i can compare this with a local buoy or lighthouse report, which is given every hour (google "nws ndbc"). This jingle will almost always work for computations like that one, even on up to several hundreds of feet, over a broad temperature range. But this jingle is definitely an approximation, and it is time to address this more specifically so we know what affects the accuracy and how to compensate for variances. It is an approximation for two main reasons. One, the density of the air decreases with increasing elevation, so it cannot be 0.44 forever as we go up. Also the conversion of a pressure measured at a high elevation to the best equivalent value at sea level pressure (SLP) at that location and time depends on the outside air temperature as well as the elevation. Worse than that, it also depends on other properties of the atmosphere at the moment and it even depends on the local geography, but the main factor beyond elevation is the air temperature. The conversion dependence on these factors is a complex one, and even meteorologists from different countries do not agree on the best way to compute it. The best rules for the highlands of Norway are not the same as the best rules for highlands of New Mexico or Colorado. For an introduction to the conversion process and the factors involved, see Appendix A3, Reducing Station Pressure to Sea Level Pressure in The Barometer Handbook. More details on the issues and challenges are presented in the WMO document CIMO/ET-Stand-1/Doc. 10, Pressure Reduction Formula, Nov, 2012. To begin, the jingle is an approximation to an approximation, and to clarify that thought we need to use the specific terms for the types of pressures we are dealing with. The short definitions are: QFE = station pressure, QNH = sea level pressure figured from elevation alone (called altimeter in aviation weather), and QFF = best value of the equivalent sea level pressure taking all known factors into account. There is a unique and unambiguous way to find QNH from QFE. We assume that QFE decreases with increasing elevation exactly like the pressure drops with elevation in the International Standard Atmosphere (ISA). This average atmosphere was developed originally by aircraft designers who needed some standard to work with. There are tables and formulas online that compute the pressure of the ISA as a function of altitude. A slick online computer is at www.digitaldutch.com/atmoscalc, which even lets you create a printable table to your design. Essentially all electronic barometers on the market that offer the option to display SLP as a function of elevation are presenting QNH and they are using the ISA formulation. Indeed, most of the time we hear or see the phrase sea level pressure the implication is that the elevation dependance is this simple one based on the ISA. If air temperature is not mentioned in the same sentence, then it has to be that one. And the results (ie QNH) are actually very close in many applications, compared to the best we could do (QFF) if we made a lot of corrections. We have to go to extenuating conditions (high elevations or unseasonal temperatures) to see notable difference, or we have to care for a precision that may be difficult to justify. So our jingle of point four four per floor is just an approximation of how the ISA pressure drops with altitude over the lower layer of atmosphere, which as noted is itself an approximation of how QFF might drop with elevation. Note I say, "might drop" with elevation. Throw a big temperature inversion in there and even the best computers will have trouble coming up with a good sea level pressure. 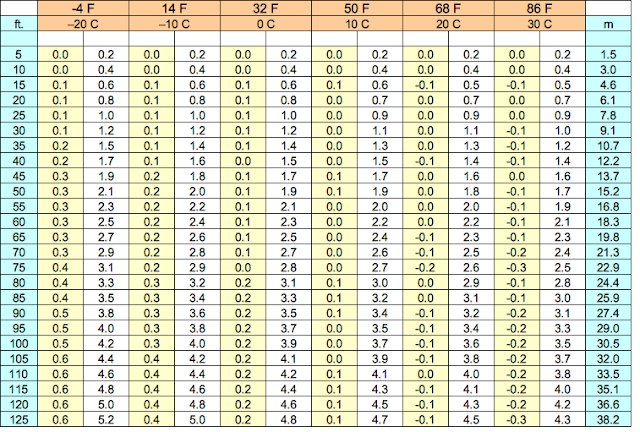 Table below shows how the jingle falls off in accuracy as the elevation increases. Also shown are the ISA air temperatures as a function of elevation. As you go up in the atmosphere, the pressure and the temperature drop. So the first thing we see is our jingle is good up to 750 ft, and still ok within a couple percent to 1500 ft. But the underlying assumption of using this conversion (QFE to QNH as an approximation of QFF) assumes the temperature of the air as a function of elevation matches that of the ISA––in some sense. This brings up an interesting distinction in language that is related to our problem here. The ISA describes the properties of the air as a function of altitude, which is assumed to be distance up in the air, whereas we are dealing with our elevation, which means a height above sea level while still on land. A cloud is at some altitude; a hiker is at some elevation. In short, we have little reason to think that the air temperature at our elevation is what it would be if there were no land below us. We know the weight of the air above us, that is QFE which we measured, so a determination of QFF is tied to making some estimate the average temperature of the imaginary air column below us, so we can figure the weight of that, which added to QFE is QFF. For practical corrections at sea we have some advantage. First we are on a uniformly flat surface (water or ice), as opposed to in a mountain range, and second we are not going to be very high. Thus the NWS Observing Handbook No.1 can include a table for navigators to use to make the correction for elevation and temperature in one step. Clearly there has to be some empirical nature to the result, because there is not agreed upon theory, and I would guess that in principle the correction depends on the pressure as well, but the main point is everyone uses the same corrections, and that is what the models need for consistency. 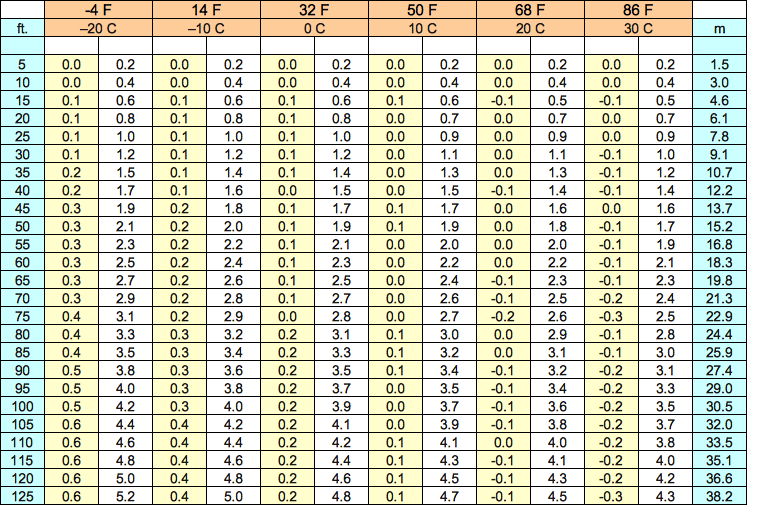 Below is the NWS table with some inserts added. The white background are the actual numbers from the NWS Handbook Table. Thus if the elevation is 110 ft and the outside air temp is 86º F, the correction to get from QFE to QFF would be + 3.8 mb. The yellow number beside it means that of this 3.8, 0.2 is due to the temperature, which caused a lower than normal correction. Likewise, if the air temp had been a chilly 4º F, the correction at 110 ft would be 4.6 mb, of which 0.6 mb was due to the air temp, and this caused a higher than normal correction. These yellow numbers come from just computing what the elevation correction alone would be using our 0.44 jingle, and then subtracting it. In a sense, the yellow numbers reflect the difference between QNH and QFF. We see from this that air temperature is not a big factor for low elevations, even with rather extreme temperatures, but since we do have this good approximation, we are better off using it than not. At higher elevations, however, these corrections are quite large. We will post here some results on that as soon as completed. These we have to compute. Our next step then––the truth meter––will be to compare our results with the differences seen in metar reports for various elevations and temperatures around the county.